Place of Birth: Harlow, Essex, England, U.K.
Rupert Grint is an English actor and producer. 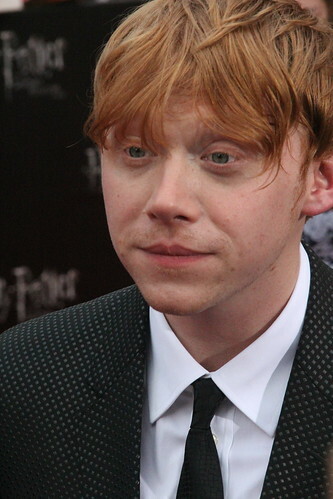 He is known for playing Ron Weasley in the Harry Potter film series. Rupert’s paternal grandfather is Christopher Alexander Grint (the son of Cecil Horace Grint and Winifred Alice Speers). Christopher was born in Edmonton, Middlesex, England. Cecil was the son of Edmund Albert Grint and Charlotte Adams. Rupert’s paternal grandmother is Paula A. Rudkin (the daughter of Albert E. Rudkin and Jean E. Berridge). Paula was born in Edmonton, Middlesex, England. Rupert’s maternal grandfather is Malcolm R. Parsons (the son of Sidney George Parsons and Winifred Doris/Dorris Ray). Malcolm was born in Edmonton, Middlesex, England. Sidney was the son of George John Parsons and Ellen Priscilla Webster. Winifred was the daughter of Thomas James Ray and Jane Elizabeth Finch. Rupert’s maternal grandmother is Andrea M. Sharkey (the daughter of Andrew Sharkey and Una Lorrain Horn). Andrea was born in Downham, Norfolk, England. Andrew was born in Roscommon, Ireland, the son of James Sharkey and Bridget/Bee McGarry. Una was the daughter of Walter Horn and Flossa/Flossie Sutton. I thought he was full Irish. Why, do you know any Irish who look like that? He’s got an African nose/mouth. Yes i think he’s full European descent but his nose and mouth look odd. If he was darker no doubt more people would see this. I think I should be clearer. I mean and i think that user meant Sub Sarahan Africa phenotypes. And I don’t mean his nose is common to SSA people. I just mean it looks like it could be influenced by SSA genes. I still stand by my belief that if he his skin and hair was darker more people would ask if he’s mulatto or quadroon. Again, he’s probably just English/Irish in ancestry but it doesn’t mean his features can’t throw people off.. I don’t know.. I mean Liam Hemsworth looks cro magnon to me and his nose still looks whiteish. Okay I admit Rupert is probably full white but I’m not the only one who didn’t think this so I guess he’s pretty ambiguous looking. I still think Brian L MAY be mixed even though I’d say his phenotype may be more cro magnon imo his nostrils still make me wonder as Rupert, Liam, Neal don’t have nostrils like his. He hasn’t got a broad nose – hes smiling!, his jawline isn’t square, its round. It appears that he is 1/8 German. His great grandmother’s name is Winifred Alice Speers and Speers is a German surname. I believe Winifred Speers was the daughter of Alexander Speers and Ada. “Speers” can be an English or Irish surname. Poor kid. Left with the name Rupert Grint.